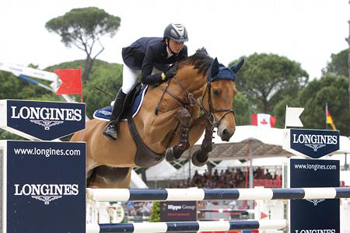 watch brand Longines, tied to the equestrian world for the past many years, confirms Timekeeper and Official Partner of the 80th CSIO Piazza di Siena 24 to 27 May 2012. A strong passion for equestrian sports has brought Longines to fill this important role in the different circuits within the CSIO Nations Cup and the most important international events. Known for the elegance of its timepieces, the brand, which in 2012 celebrates its 180 th anniversary, this year will present a model of the new line: the Saint-Imier Longines collection. The Longines passion for equestrian sports goes back to 1878 with the production of a chronograph bearing the engraving of a jockey and his horse. The Swiss brand boasts a long experience in timekeeping of equestrian events, having debuted at the Geneva International Competition Official of 1926. Official partner and timekeeper of the 80th CSIO Piazza di Siena in Rome, Longines reconfirms its strong involvement with the equestrian world, discipline can embody the core values of the brand: elegance, precision, tradition. For over 80 years the House has taken part in more than a hundred national and international equestrian competitions and has ensured the timing of numerous competitions such as World Championships and European Championships, as well as prestigious horse shows such as’ Cup CSIO and CHIO Nations, the Dubai Show Jumping Championship, the President’s Cup, The Emirates Show Jumping League Longines, Longines the Beijing Equestrian Masters. Among the equestrian disciplines followed by Longines also includes the gallop and endurance. True to tradition, Longines award at the end of the racing season the Longines Press Award for Elegance. This award pays tribute to the horsemen and horsewomen more elegant and worthy of the season. The harmony and understanding between the rider and his horse are important elements of judgment in giving the prize. The mode selection is as follows: the riders will be chosen and the Amazons who have accumulated the most points in Nations Cup events during the 6/1. During the final event to be held in Dublin CSIO, a jury of international journalists will elect the rider and the rider the finest in the running. The choice of these experts in the discipline of riding, combined with the results of sporting knights during the 6 races will determine the winners. Both will receive a trophy, a set of Longines watches and a check worth 20,000 Swiss francs. The demonstration in Piazza di Siena will instead be an opportunity to present the public with a clock that represents the philosophy and Longines slogan “Elegance is an attitude”: the Chrono Longines Saint-Imier Collection. This new collection is inspired by the origins of the tradition of watchmaking brand. The refinement of the lines and features handles give this specimen is a fine balance between classicism and modernity. 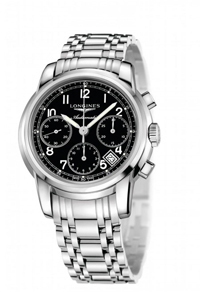 The chronograph, 41 mm in diameter, is equipped with a column wheel movement L688 specially developed and produced exclusively by ETA for Longines and presents a case with black dial and bracelet. Founded in 1832 in Switzerland, in the town of Saint-Imier, where it still has its headquarters, the House in 2012 Longines celebrated its 180 years of history and experience in the watch industry and boasts a strong sporting heritage as timekeeper for world championships and partner of international federations. It has also strengthened over the years an intense and lasting bond with the world of equestrian sports. Present in over 130 countries, Longines winged hourglass brand known for the elegance of its timepieces, is part of Swatch Group SA, the leading brand manufacturer of watches in the world.